Recently I made the decision to become vegan for number of reasons: health, environmental reasons and animal welfare. BUT I am not here to preach, and the point of my blog is not to promote the vegan lifestyle. I am here to share my love of food, and provide some recipes that will hopefully expand your love of food and cooking as well! 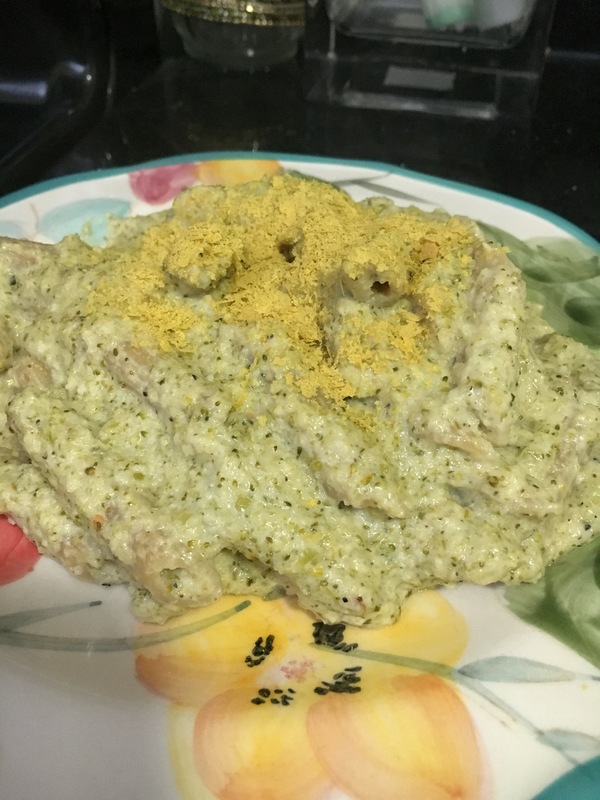 This sauce is an interesting take on a traditional pesto cream sauce, but instead of basil I used broccoli for some extra nutrients. It makes the sauce heartier as well. Set your oven to 350. Now cut up the broccoli and place the cashews, broccoli and garlic cloves on a cookie sheet or a glass casserole dish, whatever you have. Don’t worry about cutting the broccoli too much as it is going to go in the food processor. Drizzle everything with olive oil, salt and pepper to taste. All of this is going to roast in the oven for 25 minutes. After the 25 minutes, take it out of the oven and let it sit for at least 10 minutes to cool. Now it’s time to make the pesto part of the sauce. Put the cashews, broccoli and garlic cloves in the food processor with 1/2 cup of olive oil, and the juice of 1 lemon. Pulse until everything is blended together. It’s not going to be a completely smooth mixture. Next, put the pesto mixture in a large pot on low heat. Add 1 1/2 cup almond milk and stir. You can always add more almond milk if you don’t want the sauce to be as thick. Now is the time to add the red pepper flakes, salt, pepper, and nutritional yeast. The nutritional yeast is going to give the sauce a delicious cheesy flavor. I used at least 3 table spoons. Now let the sauce simmer and taste occasionally. Boil the pasta, put the pasta the sauce and you’re ready to go! I garnished the pasta with more nutritional yeast, but some fresh parsley would be delightful as well!